We were at Bomdila, a border town, one week prior to the innocuous spat between some local boys belonging to Army and the Police. Bomdila is from where the Dalai Lama came to India in 1959 after annexation of Tibet by China. During the 1962 Indo-China war, a saga of bravery by all of 32 soldiers of 1 Sikh Light Infantry under Sub Pritam Singh who gave the supreme sacrifice in continuing to guard the western shoulder of the pass did not get the credit it deserved and the martyrs remained unsung heroes. We were very impressed with the quaint little town of less than 50 thousand population where locals have genuine respect for their Army and consider them as saviours. Civil administrations and Army got so well intertwined with the local population that it was difficult to tell one from the other. Everything has changed since. The unfortunate episode was a one off incident which happened when 50 soldiers of 2 Arunachal Scouts Battalion went out for an out pass on 02 November to Bomdila. Since this is a ‘home and hearth’ unit, all boys serving in the unit are from Arunachal Pradesh itself. 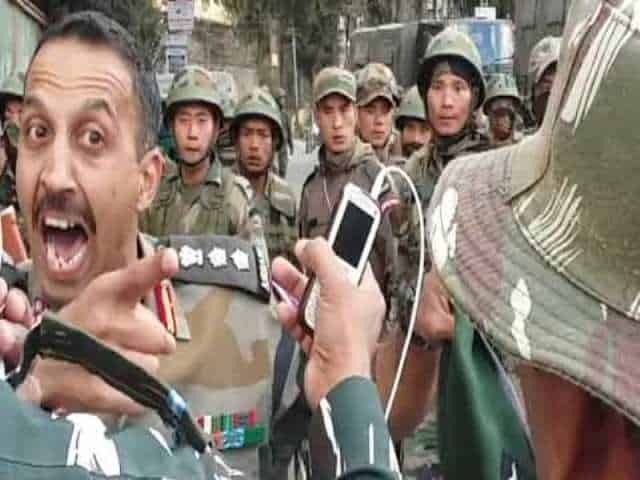 Some local boys from a different but so called superior tribe, passed inappropriate comments on two soldiers from the 2 Arunachal Scouts Battalion, a subsidiary force of Indian Army. The Scouts Battalions are based on ‘sons of the soil concept’ to give employment to border area personnel. The Army boys got infuriated and asked a cop standing nearby as to why he was not taking action against the erring boys. Since the police man was wearing a jacket, the boys did not notice his rank and thought he was an equal. The policeman, an inspector, felt slighted by the tone the boys had spoken to him and slapped one of the soldiers. He then asked for additional police force and forcefully took these two boys to the police station and beat them up. The company Commander of the Scouts boys came to the police station and took his boys in the evening. The Commanding Officer (CO) of 2 Arunachal Scouts came without security next day to meet the SP to pacify the local police but did not find him in the office. He was told the SP would be there by 2 PM. The CO returned back stating he would come again at 2 PM and found the police station fully fortified with additional CRPF and other Para Military Forces. The CO came back at 2 PM, this time with his protection, and dared the SHO to touch his boys again. While the CO was inside the police station, a scuffle took place between the boys from two forces outside and the police even fired four rounds in the air. This is an often repeated incident in urban areas where in a scuffle takes place at lower levels due to ego hassles but is generally solved at the SSP and CO level and higher HQ seldom get involved. The DC, a lady with six years of service also arrived at the police station and got involved. The young DC and the SSP coloured a normal scuffle between local boys into a civil police vs army spat and recorded five FIRs against the army also accusing army persons to have snatched police weapons and fired from them. The army has been trying to record an FIR with their side of the story but the police has not recorded the FIR so far. It may be recalled that since Arunachal Pradesh was earlier a union territory, the IAS and IPS posted in the state still come from the UT cadre. The incident was unnecessarily blown out of proportion with media also having a field day. The Raksha Mantri (RM) was in the neighbouring corps celebrating Diwali with troops in operational areas and decided to go to Bomdila to get a first hand information. She was accompanied by Minister of State Kiren Rijiu and senior army officers. She heard out both the parties and went away giving instructions to burry the case and exhorting all parties to maintain calm. Mr Rijiu is a local politician and visits Bomdila quite often. The DC and the SSP enjoy his patronage and probably that is why they got emboldened and charged up. Once the levels were raised, the Chief Of The Army Staff (COAS) also commented on the incident and was misquoted by the media in saying his boys were at fault. All he had said was that if his boys were found to be guilty, they would be punished. He could have easily got away by stating that an investigation was underway and it was inappropriate and premature to comment on the incident. The RM paid another visit and was aghast that the FIRs were not squashed. The CM asked her to post the two army boys involved out of the state. While the RM agreed to that she suggested that both DC and SSP also needed to be shifted and action should be initiated against them as well. Late DGP KPS Gill, the super cop of Punjab, incidentally originally from Assam Cadre, was asked a question by an army officer when he was a guest speaker in Army War College as to why army and police officers maintained a distance from each other. His answer was very simple and he said both were at fault. The army officer normally remained confined to their cantonments and the police officers were too busy managing day to day law and order challenges and guarding the politicians. He said that he and the General Officer Commanding from the Army in Assam had no problem whatsoever as they met often and dinned together. Therefore, there was a better understanding of each other’s functions, limitations and ethos. The answer as per him was to maintain personal rapport at all levels and keep the channels of communication open. Army and Civil Administration officers have interaction at the lowest level when the IAS/IPS trainees are sent for army attachment. At the working levels, they are very closely associated with each other in insurgency prone areas where army is deployed or when army is called out in Aid to Civil Authorities. At higher levels, periodic meetings are held at Unified Headquarters at state level and correspondingly at formation and district levels. At the apex levels there are meetings held at Cabinet Committee for Security in addition to meetings of officials of Ministries of Defence and Home. In a one year training course at National Defence College, selected senior defence and civil administration officers are given a formal training on national strategy for security and an exposure of each other’s functioning ethos. The stalemate continues in the small border town at the time of writing and the DC has refused to meet anyone from the army including the Brigade Commander over these days stating she is very busy. It may be recalled that the army clears the stranded traffic due to heavy snow every year in these border towns and rescues thousands of stranded tourists without a formal request by the civil administration. The local police is conspicuous due to its absence in such relief operations. The acid test is the impending Maitri Diwas scheduled after a few days wherein army takes part in celebrations in large numbers in support of the civil government. With five one sided FIRs launched against the army, it is near impossible for the army to take part on the same platform as civilians. The key lies with the CM of the state who should order squashing of all FIRs and usher in peace and tranquility. The erring officials on both sides need to be moved out of the area expeditiously.